this is what will be in the gallery booklet for people to take home with them. 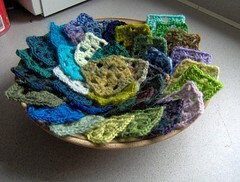 In knitting I reclaim a lost domestic art that reaffirms family and home. I reclaim the idea that what we do daily and the items that we surround ourselves with are important and affect the quality of our lives. I reclaim a rich tradition of provision, beauty, and care that has been passed down through the generations, as knitted garments and patterns are passed from hand to hand. I reclaim the good gifts of God in natural fibers and use them to good ends that glorify Him. I spin wool from sheep. I recycle sweaters that have had too little thought put into their manufacture and create from them new, lively beauty. And lastly, I reclaim for myself and for my neighbors, students, and friends the image of God given to us by a good creator ‘to make’ and be creative creatures ourselves. I nestle myself into Genesis one, reaffirming and revitalizing my relationships with God, His earth, and other people. This entry was posted in knitting, theology, thesis by cosymakes. Bookmark the permalink. Your talent with words is as great as your talent with fiber. Very well put. I hope the show is wonderfully attended and that it inspires the audience to consider similar acts of reclaiming lost craft/art themselves. wow…I’m printing that out!!!! Beautiful. I’m really excited and encouraged by your thesis direction. I’ve been lurking around for a while, but I just wanted to wish you lots of joy as you continue to create. I really like how your thesis involves bringing creativity to others and opening up ways for them to meet God creatively. I go to a Vineyard church in Northampton, MA that is about a year old and one of our big dreams is creating an arts center that provides opportunities for people to learn skills to express themselves creatively and experience God in a different way. Thanks for your blog – I really enjoy it. very nicely presented. thanks for sharing it. thrilled for and with you, and cheering out here in NY! That is so lovely! I’m really enjoying reading your blog.